I have really good news for everyone. You can thank little vegan planet for finding this one. Trader Joe’s started stocking a few cake mixes and whenever I see something new on the shelves I check to see if it’s vegan. I picked a box of vanilla cake and it was definitely not vegan so I didn’t bother checking the rest. 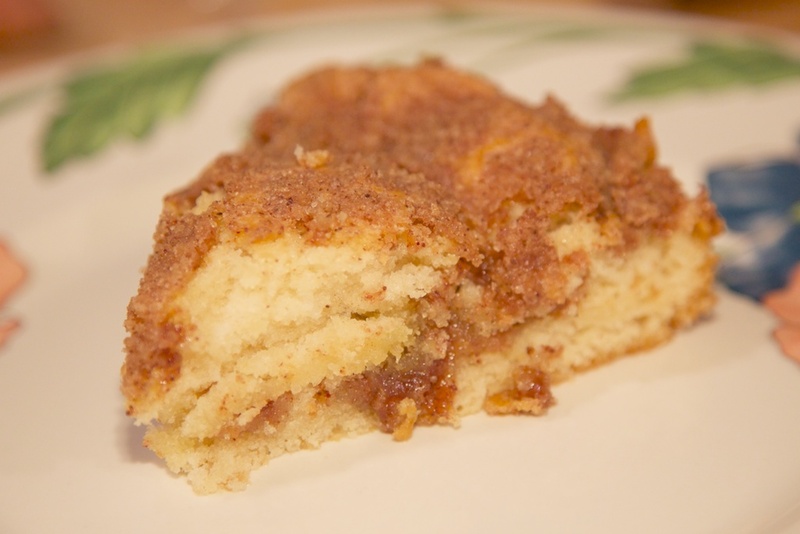 Turns out, the coffee cake is vegan. I don’t usually make boxed baked goods, but hey, who doesn’t like an easy dessert every once and awhile. So I followed the directions on the box using almond milk and Earth Balance instead of milk & butter. Threw in a teaspoon of egg replacer and 2 tablespoons of water. Did some stiring and some crumbling. Forty minutes later we had a delicious coffee cake. So go make some freaking coffee cake already. It’s easy, it tastes good. It’s vegan. Yay! I love finding random, easy-to-make vegan foods. I keep a mental list for people who think veganism is too inconvenient. no way, I’m all over this, but using applesauce instead of earth balance. thnks! Looks great! I almost bought that mix on Sunday – now I’ll definitely try it next time I’m at TJ’s. I once spent a long time standing there in the aisle reading the labels of every boxed mix that TJ’s had and pleasantly discovered that the coffee cake as well as a few other mixes are vegan. I purchased every mix that was and have tried most of them – the coffee cake is actually next on my list! There are brownies as well as pumpkin, apple and cranberry breads. As my egg replacer I use a mashed banana or flax powder and water or applesauce which makes each of the baked goods even more delicious, moist and nutritious!